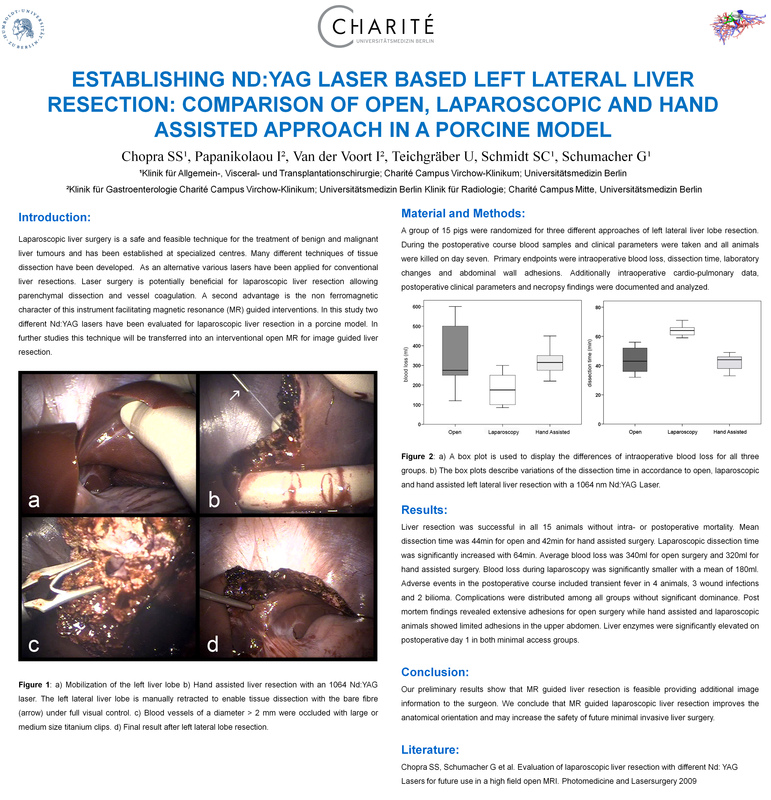 Aim of this study was to assess the feasibility and safety of a 1064 nm Nd:YAG laser for left lateral liver resection in a porcine model. Laparoscopy and hand assisted laparoscopic surgery were evaluated and compared to conventional open surgery. A group of 15 pigs were randomized for three different approaches of left lateral liver lobe resection. During the postoperative course blood samples and clinical parameters were taken and all animals were killed on day seven. Primary endpoints were intraoperative blood loss, dissection time, laboratory changes and abdominal wall adhesions. Additionally intraoperative cardio-pulmonary data, postoperative clinical parameters and necropsy findings were documented and analyzed. Liver resection was successful in all 15 animals without intra- or postoperative mortality. Mean dissection time was 44min for open and 42min for hand assisted surgery. Laparoscopic dissection time was significantly increased with 64min. Average blood loss was 340ml for open surgery and 320ml for hand assisted surgery. Blood loss during laparoscopy was significantly smaller with a mean of 180ml. Adverse events in the postoperative course included transient fever in 4 animals, 3 wound infections and 2 bilioma. Complications were distributed among all groups without significant dominance. Post mortem findings revealed extensive adhesions for open surgery while hand assisted and laparoscopic animals showed limited adhesions in the upper abdomen. Liver enzymes were significantly elevated on postoperative day 1 in both minimal access groups. Nd: YAG laser based liver resection is a potentially safe and feasible technique. The minimal access approaches show comparable results to the open technique with reduced abdominal trauma and less adhesions. Laparoscopy was more time consuming but showed reduced blood loss compared to both other groups.